I’ll never forget the exact moment four years ago when I knew I “had” to live on a farm. Winter was winding down and the day was pleasant- We bundled the kids and went outside to let them play in the soggy grass out back by our potager (back when we had a small yard– before the potager expansion). Typically, at that time of year my gardeners heart surges with joy but as I sat back there all I could think was, “This is not enough.” Not a very “content” thought, I know. But, I looked over at Joel and I could tell, he felt it too. Why we had never pursued our own farm before is really beyond us. We can’t figure it out. I come from a family of farmers and Joel and I both have a very distinct “love of land.” But nonetheless, that is the day that we began to talk about making it a reality. In eleven days we get the keys. A little over 3 acres. But I put this together cause I am so excited. In 2013 we are going to raise chickens for meat & eggs (blue, brown and chocolate), keep bees… for our own honey! Grow vegetables, sunflowers and other flowers for bouquets and in the fall we will have Cinderella pumpkins. Our farm is just outside a very popular antique town so the kids and I hope to put out a sign and sell our goodies (and maybe some French inspired restyled antiques) on a little farm stand. The place is so gross. We have SO much work to do before we move it. When we get the keys on the 15th I am bring my video camera so I can give you a tour. I can’t believe this is happening…. Believe it! It couldn’t be happening to a nicer family. so very happy for you. It won’t be gross for long! Angela I am so excited for you and your family! This new adventure will be glorious I am certain! My husband and I share the same dream with you and yours. We hope that someday it will come true! We moved from California track housing to Washington state almost 4 years ago. Sadly we are renting a cabin, but it’s on five acres next to the Green River and is a little boys paradise. We have been able to plant a small garden, but dream of a larger one, with chickens, ducks, maybe a goat or two. 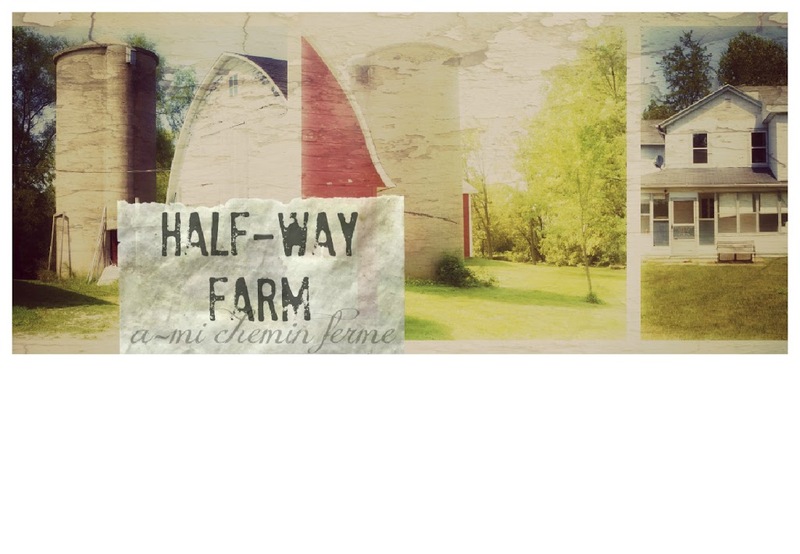 I cannot wait to see the transformation of your halfway farm and wish you all the best! 🙂 Your spirit needs space to grow and flourish! Enjoy!!! Lovely! Can’t wait to see what you do with it! Wishing you the best! I’m so excited for you!!! I have been stalking real estate lately, looking for a piece of land for me and my kids…so I get it! I get it! What a Dream come true! How exciting for you and your family. In no time it will feel and look like home.I am sure you will work your magic! I am excited for you and will follow along in your new journey. So excited for you! We’ve been waiting for our farm for years, too. God is faithful, for now I will rejoice when I see other’s dreams come true! Can’t wait to see what your farm dreams will grow into. So happy for you..It will be a journey but one that will create so many memories for your family..Excited to see the video and then how you put your touch on the home when you get in..Have a wonderful week.. SO happy for you!!! We have farm and I just love living out in the country. We have chickens the first time this summer and it is sooo fun watching the little kids go crazy getting the eggs each day. Next summer we are praying that Al has time to build us some raised garden beds to grow potatoes and other yummy food:) So fun and good for kids. Can’t wait to floow along as you get in your farm house!! So very excited to see it and what you do with it! Congrats! I am so happy for you and your family! I will be praying for a good move for you. Have you ever thought of putting a French lesson in the magazine? Maybe something to translate and explain simple phrases that often make their way into English? Congratulations!! I know you will make it your own and it will be beautiful!! It will start out like the ugly duckling and become a swan!! I love the farm stand idea!! My husband, girls and I had a farm in NW New Jersey for 8 yrs. and we loved every minute of it! The girls will never forget their adventures on our 13 acres with our horses, sheep, dogs, birds, etc. Your children will thorough enjoy this life! Congratulations again!!! Congratulations by the way, I’ve been praying for a farm myself, ever since I was little. Still waiting, and still praying : ) (And I found my dream one- for sale- about 2 months ago. Unfortunately the $370,000 ain’t happenin’) Can’t wait to see what you do with the place! The literal translation would be “la ferme mi-chemin” but what it means is more like a farm in the middle of the path. The term half-way if you are trying to use it like a half-way house, does not really exist in French. Not sure if that helps at all. I’ve got my sleeves rolled up and some grease applied to elbows!! help is on the way …. Congratulations, Angela! So thrilled it worked out,and I’m very excited for the journey you and your family are embarking upon. Can’t wait to see if you can “out-gross” what I started out with 15 years ago!!! “Gross” will become “Grand” in no time!!! I’ve been quiet on the blogsphere lately but wanted to pop in on here and tell you congrats! Having recently moved into our dream ‘older home’ I know how it feels to be excited about making an old home your home..
May God continue to be your foundation on which you build your earthly home. So excited for you …I love Wisconsin… I grew up in Northern Ill. about 15 miles away from WI. I had the best childhood ever… All the things that you said we did and we lived on a lake. I live in Southern California now. It is a special place too but where you are going to be is a different sort of special… Midwest values are something that you can’t teach. They are behavioral and come with growing and understanding the land. The people there are so grounded and just real folk! I visit there every year. I hope to come in the spring. Have a spring sale and I’ll come!! !